As this is an extremely popular event, it is best to plan your accommodation early. If you are coming from San Diego, Southwest and Alaska are the only two that fly direct to Albuquerque International Sunport (not Airport!). My roommate and I booked our tickets in early September and we ended up having to fork over 30,000 Southwest Rapid Reward points for one round trip ticket which is almost 6 times the amount you would need on a regular weekend! Luckily, I have the Companion Pass to offset that cost. We chose to go for the second weekend of the event because we heard that it would be less busy than the first. Shuttle is really the best way to visit the Festival. You can book round trip shuttle ticket which includes park admission for $15 online in advance at the Balloon Fiesta Website. This will save you a lot of headache from the heavy Fiesta traffic and having to find parking. One of the shuttle pickup points is at the Coronado Center , a kitty corner from the Sheraton Albuquerque Uptown. Hotel prices for these two weekends will be very high so it is a good opportunity to redeem your points. Pro Tip: Stay Close to the Shuttle Pick-Up Point and wake up EARLY! The Sheraton Albuquerque Uptown turned out to be an excellent place to stay for the Fiesta. The hotel provided shuttle service to the Park & Ride at the Colorado Center which is only minutes away from the hotel. It was also a great redemption for the Fiesta weekend. Normally a category 3 SPG property, you only need 8,000 SPG points for the night (now 24,000 with the new Marriott/SPG combined program). You can easily get 2.5 cent per point value with room price being north of $250/night during the Festival period. We were warned by the hotel staff that the festival gets extremely busy so we decided up catching one of the first shuttles at 4:30 am. This has proven to be an excellent idea since there were no wait for the bus and we got to the Fiesta within 30 minutes, hitting minimal traffic. We arrived at the Fiesta around 5:00 AM which leaves us some time to grab donuts and coffees. The fair has the feel of a mini county fair with food and souvenir vendors lining the side of the launch field. After our breakfast fix, we decided to walk onto the field and got a good spot next to the balloonists prepare their balloons for launch. There was even a mini Laser show to keep us entertain while we are waiting for the first event of the morning. A group of 10 or so balloon called the Dawn Patrols will be launched right after sunrise to examine the morning's weather condition. If weather permitted, these balloons will send down the green light and the main event of the morning, the Mass Ascension, will begin. As its name implied, the Mass Ascension is when all the balloons lift-off together as dawn breaks. The Mass Ascension is let by the "Sponsor of the Day" balloon carrying an American flag lifting off with the tune of The Star Spangled Banner. We learned from the veteran balloon watcher on the field that the parking lot up the hill just outside the park provides the best view of the Mass Ascension. You'll see a lot of locals with there fold-up chairs sitting there to view the balloon. Most of the photo in this post were taken from this location. Another good location is the Anderson Abruzzo Albuquerque International Balloon Museum which is located on the south side of the field near Balloon Museum Dr NE. The location marked by the red pin is probably the best location to view the Mass Ascension. It really was quite a sight to see balloons of different shapes and sizes rose up into the sky together. There were regular round balloons and gravity-defying shaped ones like the chicken balloon, the pig balloon, or even Darth Vader and Yoda balloons! The whole Mass Ascension event took about an hour as waves of balloons are being launched. The balloons that did not go up in the allotted time will remain on the field. This is a good time to go back to the field to get close-up look at the balloons. The balloonists will start to pack up their balloons back into their trailers around 8:30 am. That was the queue for us that it was the time to leave. Located 10 miles east of the Fiesta Ground, the Sandia Peak Tramway is the Longest Arial Tramway in America. One way trip takes 15 minutes with elevation gain of approximately 4000 feet. The tram is very busy especially during the Balloon Fiesta and before sunset. We had to wait about an hour in line just to get the ticket to go up. Although, you could technically "skip the line" by getting a meal at the restaurant at the base of the tram. The view at the top is quite spectacular, though. The backside of the peak is a ski slope although there is no snow during this time of the year. From the tram side, you could see all the way to the Fiesta field and even the city of Albuquerque! Pro Tip: Get a pass for your return trip as soon as you get to the top. You will need a color-coded pass in order to take the tram down. I recommend that you get this pass right after you get up to the peak before you go roam about. The reason being that there will be a mass of people waiting to get down right after the sunset and you can end up spending more than an hour waiting in a cramp tram station at the peak if you don't get your pass early. Capital city of the State of New Mexico, Santa Fe is located just an hour north of Albuquerque. It is a quaint little town full of historic Catholic churches dated back to the early 17th century. The city also have a very unique architecture with a lot of low-slung, earth-tone buildings. Even newer residential homes around the outskirt of downtown Santa Fe are being build with the same color tone. You can easily spend one full day in Santa Fe. However, if you have limited time, I would recommend you to visit an antique shop Seret and Sons. Their wooden door collections is quite fascinating and if you have the chance of talking to Mr. Seret himself he will be able to tell you where he got a lot of the pieces from. Saret and Son's collection of antique doors. There are a lot of other interesting artifacts inside the store but sadly photography is not allowed. Another place worth visiting is the New Mexico History Museum to learn about the history of the city. You will also be able to see the inside of the Palace of the Governor. 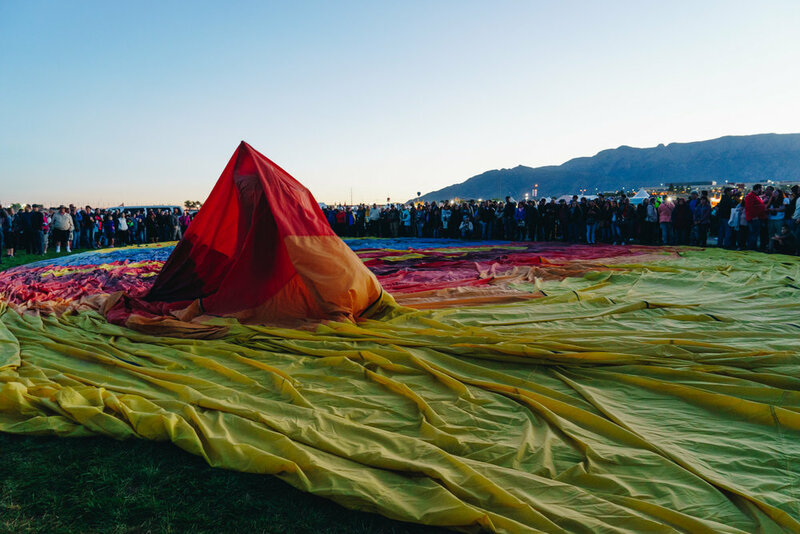 The Ballon Fiesta is one of the most unique events that is happening in the fall. It is definitely worth checking out if you don't already have plan this October.